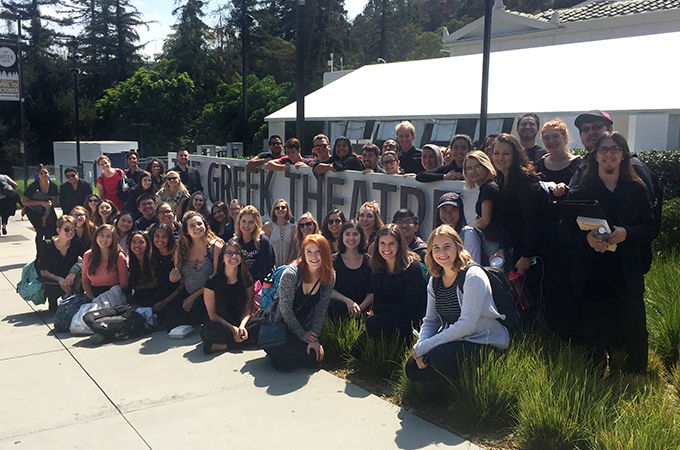 On Saturday, September 16, the University of Redlands Chapel Singers and Bel Canto choirs performed alongside The Who’s Pete Townshend at the Greek Theater in Los Angeles. The two-hour performance of Pete Townshend’s Classic Quadrophenia featured solo performances from rock music legend Billy Idol and classically trained tenor Alfie Boe, backed by a full orchestra and an 80-person chorus—U of R voices included. Professor of Choral Studies Joseph Modica prepared the U of R choirs for Quadrophenia. “I’ve been working with my friend, Steve Trudell, on various projects for about 10 years,” says Modica. “He asked me if I wanted to get involved with Quadrophenia, and, of course, I did." Nicholle Andrews, director of choral studies at the U of R, said that students worked quickly to familiarize themselves with the music in just 10 days. “Fifty-six students performed at the event, and they received the music the first week of classes!” she says. The Los Angeles Times described Pete Townshend’s Classic Quadrophenia as The Who’s “great opera.” The show, which was performed in Massachusetts, New York, and Los Angeles, is an orchestral adaptation of the rock group’s 1973 double album, Quadrophenia.